On February 10, 2003, DEC Commissioner Erin Crotty approved permits for Waste Management of New York (WMNY) to construct and operate a new regional landfill in Albion (Orleans Co.) that will dispose over a half-million tons per year of municipal solid waste, or 7.35 million tons over the lifetime of the dump, about 1,000 feet from the banks of the Erie Canal. However, following the DEC permit decision the Town of Albion looked at the same evidence and denied a local permit. Waste Management sued the town but the Orleans County Supreme Court dismissed the suit and validated the town's action. Waste Management appealed, but in February 2007 New York's highest court let the decision stand. As a result, the landfill proposal is dead. The DEC Commissioner's decision was also successfully challenged in part, in a lawsuit brought by Stop Polluting Orleans County, Inc. and the Citizens' Environmental Coalition. The Albany County Supreme Court found the Commissioner illegally departed from longstanding DEC policy by removing provisions from WMNY's permit that would have made Waste Management pay for DEC expert environmental monitors, their overhead (equipment, office and training) and fringe benefits. Instead, WMNY would be allowed to hire its own private monitors. As a result of the court’s decision, the DEC must either reinstate the old policy or provide notice and an opportunity for public comment before officially changing the policy. We've posted that decision from a link below. What follows is a history and backround for the landfill proposal itself. The proposed landfill footprint is adjacent to two closed landfills that are presently leaking pollutants into local groundwater. Half of the projected 750 truck trips per day will transport garbage over the Albion central school's cross-walk. The Town of Albion has jurisdiction for local approval of the landfill, and retains authority to deny permission for the project to go forward. A DEC permit decision has no effect on a town's power to decide independently whether to host a landfill. Most of Commissioner Crotty's 12-page 2003 interim decision addresses WMNY's suitability to hold the permit, owing to its own record of environmental violations as well as its relationship with notorious Waste Management, Inc., rejecting DEC Judge Edward Buhrmaster's 2001 ruling that SPOC should get a hearing on this issue. Judge Buhrmaster was convinced that SPOC had offered proof that a reasonable person would follow up before deciding WMNY was fit to hold a New York landfill permit. However, at the end of her decision, commissioner Crotty added a permit condition that had never been discussed in the pre-hearing conference: she decided that Waste Management should be allowed to dispense with DEC on site environmental monitors, required at every landfill in NY, and hire its own. That kind of high-handed arbitrariness was rejected on May 17, 2004, by the Albany County Supreme Court after SPOC and CEC teamed up to challenge the decision. For our analysis of the Interim Decision's treatment of the fitness issue click here. Background on Waste Management's Albion landfill proposal follows below. The proposed landfill site is located approximately one hundred yards from the banks of the Erie Canal, adjacent to two older waste sites, including one Superfund site, already leaking contaminants into the Canal. In fact, WMNY proposes to construct its new landfill partly directly over one of these leaking landfills, raising an issue whether its contamination will ever be distinguishable from the older dumps. Three Canal towns near the landfill were recently awarded $8.8 million in federal and state grants to revitalize the canal for tourism. In August, 1999, the New York State Canal Corporation dropped its objections to the landfill proposal, which had been based on concerns over visual impacts to the Canal and groundwater leakage into the Canal. (Buffalo News, 8/20/99, p. 5C). This paved the way for WMNY to apply for a permit to construct the landfill from the New York State Department of Environmental Conservation (NYSDEC). Waste Management of New York also operates the High Acres Landfill in Monroe County, as well as a landfill in Long Island and a number of transfer stations in New York City. In 1998 WMNY purchased CID, which operates a landfill in Chaffee, NY, and is vying for another new landfill in the town of Eagle. (Each of these sites may be located on our landfill map.) WMNY became a subsidiary of Texas-based garbage giant USA Waste after USA Waste purchased parent Waste Management, Inc., last year for $15 billion. Now the largest garbage company in the world, USA Waste has taken the name of the company it swallowed, WMI. Late last year a class action lawsuit was filed against WMI alleging securities fraud during the spring of 1999 when Waste Management representatives artificially manipulated the company's stock, boosting its value to a high of $60 a share, and allowed officers and directors to sell off 1,036,547 shares, pocketing $57.3 million. About the same New York Attorney General Dennis Vacco accepted a position with WMI as regional vice-president and president of WMNY. (Times Union (Albany, NY), 8/17/99, p. E1). Vacco says he wants to position his company to exploit the huge market in garbage he expects to be created when the Fresh Kills Landfill in Staten Island closes in 2002. (Buffalo News, 7/30/99, p. 7B). New York City must divert some 13,000 tons of residential garbage per day from Fresh Kills. WMI recently settled the main class action securities fraud lawsuit and is involved in settling more than half a dozen lawsuits and countersuits it spawned involving former management officials and angry investors who have filed their own complaints against the waste industry giant. The proposal enjoys relaxed scrutiny from NYSDEC because the Orleans Sanitary Landfill, forced to close in 1991 after allegations of illegal waste dumping and a state environmental crimes investigation, is located on the proposed site. That means Waste Management may apply for an "expansion" of the old landfill and need not apply for a new landfill permit. It also means any pollution from liner leaks in the proposed new landfill will be difficult to detect, because the groundwater around the site is already contaminated with landfill leachate from the old Orleans landfill. Nevertheless, the high water table and close proximity to the Erie Canal required WMNY to obtain a variance from DEC regulations requiring a 5-foot separation between the bottom of the landfill liner and the seasonal high point of the water table. (See the 5/26/99 DEC Hearing Notice of WMI's application, which includes an application for a variance from the depth-to-groundwater regulation; or search on "360-2.13(d)" of the ALJ's 12/31/99 Ruling). This variance was granted with the Commissioner's Feb. 10, 2003, final decision. However, a state permit is not enough. The garbage giant must also get approval from the Town of Albion for a local permit. No local permit has been granted and no host community agreement has been made. The Albion Town Board has always opposed the proposal, but in 1997 settled a $18 million suit brought by Waste Management in early 1996, in response to enactment by the Town of a landfill ban law. After nearly two years of litigation the Town couldn't afford the legal costs. As part of the settlement, the current town board has promised to give the proposal a "fair review." (See Buffalo News, 9/30/97, 5B; 10/2/97). Despite WMNY's offers of host benefits to the local community, the Albion Town Board and all other towns as well as Orleans County have refused to enter into any host community agreement. 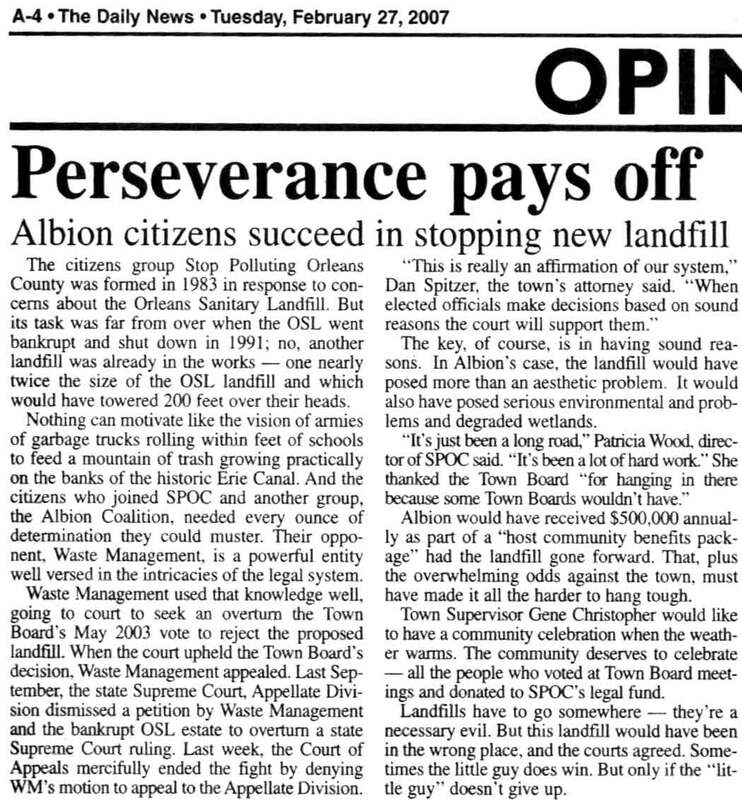 On May 19, 2003, three months after DEC Commissioner Crotty directed that state permits be issued for the landfill, the Albion Town Board voted to denial local permits to Waste Management. The company then sued the town. But a town's power to say no to landfills has been consistently affirmed in every such lawsuit in New York. On May 11, 2005, the Orleans County Supreme Court dismissed Waste management's lawsuit as without legal grounds.